We want you to enjoy total peace of mind when you buy a new car, truck or SUV here. 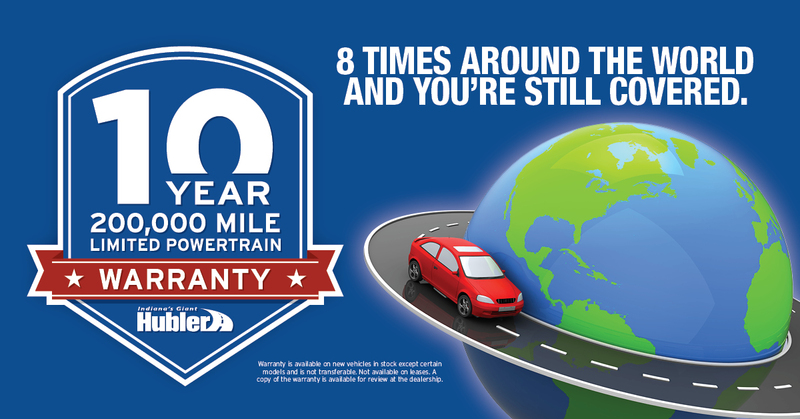 That’s why we include a 10-year/200,000-mile Limited Powertrain Warranty with every new vehicle we sell -- at no cost to you. * That’s enough coverage to drive around the world eight times! Visit one of our car dealerships near Avon, IN, to learn more about the incredible Hubler Limited Powertrain Warranty. What Does This Powertrain Warranty Cover? Who backs the warranty? Is it just the dealership? Our warranty is backed by an A-rated insurance company and administrator. With a solid foundation behind our warranty, you can enjoy total peace of mind. Do I have to do all of my auto service at a Hubler dealership? No. Our award-winning service department will exceed your expectations, but you are not required to schedule service here. However, you must keep your service records. How much does the Hubler Limited Powertrain Warranty cost? This warranty comes at no extra cost to you! We provide this additional coverage on every vehicle we sell as an expression of the confidence we have in our vehicles and to show appreciation for our customers. No extra car maintenance is required. Simply follow the manufacturer’s recommended maintenance schedule. Is the warranty transferable if I sell my car? 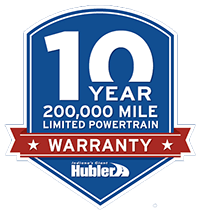 The Hubler Auto Powertrain Warranty is included on new vehicles in stock. This excludes fleet, commercial and diesel vehicles. The warrany does not apply for modified vehicles. Buying a new car is an investment, so we want to show you that we’re also invested in you and your happiness. We want you to think of Hubler Automotive first when your friends and family are looking for Greater Indianapolis car dealerships to buy from. The Hubler Powertrain Warranty is just another way we say thank you for choosing Hubler! *DISCLAIMER: See dealer for complete warranty details. A copy of the warranty is available to read prior to sale at the dealership. Warranty not offered on leases, commercial use, including being used for hire to public or vehicles registered in a business name. Corvette, Honda GT Civic, Camaro ZL-1, Mustang Shelby, Nissan GTR and other models may be excluded. Warranty is for the original owner and is not transferable.